At election time, do you choose between the lesser of two evils? Do you ask yourself, "Is this the best we can do?" 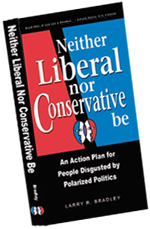 Do Polarized American politics disgust you? Does the inability to solve our national issues drive you crazy? Do you wish you could do something to clean up this mess, but then you immediately trip over thoughts like these? Why are things so vicious and antagonistic? Where is the reasoned voice of wisdom to show me the way? Who has the time to figure out "the" solution? Not me. The whole business is so slimy and disgusting, it repulses me. And, anyway, what impact can one person have? If these are your feelings, then this book may be what you've been looking for.